We're off to our last camp! See you in a week! A few nights ago I watched about five minutes of "To Catch a Predator." It was stunning to witness the very moment when a man's life came tumbling down. Everything he had built for his career, his family, and his own freedom was destroyed. To see something like that happen is a sobering thing. One man was in his sixties. A whole lifetime...rubble. I think the way the program sensationalizes this issue probably throws bait to men who have never even been tempted in this way. The producers should be ashamed of that. I won't be watching it again, but it did give me a lot to think about. I had spent that very morning reading about King David's moral failure with Bathsheba, the conception of their child, the murder of her husband, and the death of their firstborn. (See 2 Samuel 11-12.) David had been a man after God's own heart. He was the Lord's anointed. How did that happen? It terrifies me that a person can fall from such heights. It terrifies me that the flesh I am bound to until God calls me home is capable of anything - absolutely anything - given the right circumstances. Praise God that His grace can restore and redeem us, but I would rather not have to go there. Been there, done that in the teenage years. I do not want to suffer like that again. Ever. I would rather God take me home. One of the major wake up calls I had regarding my lack of a consistent quiet time earlier this summer came when I was driving home from aerobics. I was listening to someone like Chuck Swindoll on the radio and whoever it was said that the Holy Spirit is faithful to warn us that we are walking into destruction if we are not quenching Him. I already knew it, but I needed to hear it again LOUD AND CLEAR. I realized that my lack of consistent time with the Father was causing me to compromise in what I watched, listened to, read, said, and thought about. The Spirit was being quenched and was therefore not full in me. I had started becoming numb to His conviction in certain areas. I had made myself vulnerable to my flesh and to the tempter of my flesh. At that point, I basically threw myself at God's feet in repentance and said, "Hide me, Lord. Fill me, Lord." Ladies, many us are believers. Many of us love the Lord with all our hearts and can't imagine disobeying Him so blatantly that we destroy everything He has given us. Many of us are surrounded by the eyes of people who do not know Jesus and we are trying to show them that our faith is authentic. Many of us serve in our churches, are perhaps even married to ministers, and have the respect of other godly women. But we are not immune to temptation. We are not above or beyond walking into destruction. The fact that many of us do not realize this or forget this makes us prime targets. 2) Let's avoid opening doors to temptation and demonic activity. If God has said NO to something, it is for our protection. If we are reading, watching, or listening to se*ually explicit material, we are inviting pain into our lives. 3) Let's tell someone when we're being tempted. The moment we speak it out, a measure of its power is broken over us. Thank You, Jesus. This also gives us the benefit of having someone to pray for us and hold us accountable. About a month ago I read something that God had specifically and loudly told me not to read. I foolishly underestimated the effect it would have on me. Because I opened that door, I spent two weeks suffering the mental bombardment of memories of everything I had ever done. When Jesus told the woman at the well everything she had ever done, it gave her life, hope, and freedom. (See John 4.) But this was not Jesus speaking to me. It was the voice of the accuser. It brought condemnation, guilt, powerlessness, and captivity. I feared that the changes God had made in my life over the past seven years were not real. False. I am a new creation! (See 2 Cor. 5:17.) What do you think he would have accomplished by convincing me that I wasn't really different? Scary. The point is, if I had known what I would be inviting into my life when I disobeyed God, I would have never done it. When David first gazed on Bathsheba bathing on the rooftop, he didn't get to consult a list of consequences he would suffer. He didn't know it would end in murder and the death of his child. If he had known, he wouldn't have done it either. Here's something we can count on - sin will stay around longer and do a lot more damage than we ever planned for. Therefore, let's do whatever it takes to guard ourselves, and therefore our families, from this destruction. It is more than worth it! I could write a book about this, but thankfully my mom already did. It's called When Godly People Do Ungodly Things. I think it holds an incredible message for anyone who has fallen, who has a loved one who has fallen, or who wants to guard herself from falling. That pretty much covers everyone. "If you love me, you will obey what I command. And I will ask the Father, and he will give you another Counselor to be with you forever—the Spirit of truth. The world cannot accept him, because it neither sees him nor knows him. But you know him, for he lives with you and will be in you. I will not leave you as orphans; I will come to you...Whoever has my commands and obeys them, he is the one who loves me. He who loves me will be loved by my Father, and I too will love him and show myself to him" (John 14:15-18,21). "Flee from se*ual immorality. All other sins a man commits are outside his body, but he who sins se*ually sins against his own body. Do you not know that your body is a temple of the Holy Spirit, who is in you, whom you have received from God? You are not your own; you were bought at a price. Therefore honor God with your body" (1 Corinthians 6:18-20). "For this reason [Jesus] had to be made like his brothers in every way, in order that he might become a merciful and faithful high priest in service to God, and that he might make atonement for the sins of the people. Because he himself suffered when he was tempted, he is able to help those who are being tempted" (Hebrews 2:17-18). "These things happened to them as examples and were written down as warnings for us, on whom the fulfillment of the ages has come. So, if you think you are standing firm, be careful that you don't fall! No temptation has seized you except what is common to man. And God is faithful; he will not let you be tempted beyond what you can bear. But when you are tempted, he will also provide a way out so that you can stand up under it" (1 Corinthians 10:11-13). "If you then, though you are evil, know how to give good gifts to your children, how much more will your Father in heaven give the Holy Spirit to those who ask him!" (Luke 11:13). 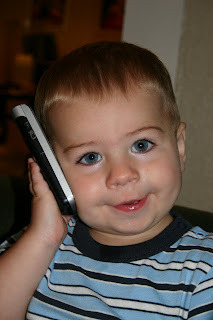 He loves to "talk" on a cell phone. And that is why mine is currently broken. Any attempts to reach me by phone for the next week will prove futile. Most of the time he's all smiles. Every few days someone asks me, "Does he ever get mad?" 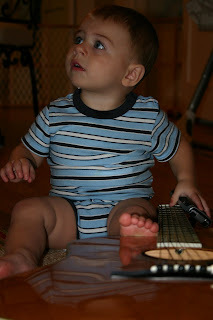 His current obsession is Daddy's guitar. The question is, will he call it a guiTAR or a GUITar? His parents are divided over this issue. Today my amazing hubby took me on a lunch date. We are not very good about getting babysitters as regularly as we should, so we have started taking advantage of the fact that Jackson is at mother's day out on Curt's day off. First of all, we all slept till 9:30. Someone say GLORY! Then I dressed up like I would for an evening date and we went to this wonderful place called Bread Winner's. Any fans out there? I had been there once a few years ago but I didn't remember the magnitude of its goodness. When you sit down they bring you an assortment of sweet breads from their bakery. It is another one of those places where all the Beautiful Mommies go. I saw a lady there in a pink Juicy outfit with a matching pink Prada purse and her baby in a leopard print baby carrier. She was major, as Mrs. Beckham says. It is definitely on the list of places to take my sweet mother-in-law next time she's here. Then we swung by Baby Bliss, where I got this on sale for Jackson. And who can be that close to JD's without stopping by for some cookies? I love Fridays. When I picked up my child he had not yet napped - perhaps because he slept until 9:30. I got in some trouble for bringing him to MDO pretty late. But honestly, would you forfeit the chance to sleep in to make sure your kid was there on time? Jackson was thoroughly tired when he got home and went straight to bed. I have been able to enjoy a couple of quiet hours in my house doing work and now blogging. Let's show a little link love today. Jungle Mom recounts the journey she and her family have traveled as missionaries for the past 24 years. BooMama has unveiled part two of her interview with Mandisa. Debra is having a praise party. And her blog recently got a very cute makeover. Simri is looking for little boy present ideas. Courtney wrote a really sweet post about her baby girl. And Lori is sharing her wisdom about bargain shopping. The fact that I have about a hundred things to say, none of which matter a hill of beans, is proof that I need to re-establish my blogging discipline. Because up until 10 days ago I blogged timely, concise posts about very important things. Wonder Woman Week is going well. It has been a pretty boring, uneventful week but I think that was the point - to be busy at home. Not at the mall. Not driving all around town. Not going out to eat for every meal. It's been good though. It's like homemade vanilla instead of mint chocolate chip. Both are good but if you only eat mint chocolate chip you forget how good vanilla is. -Today I heard Achy Breaky Heart on the radio in Spanish. -Jackson has outgrown all of his pajamas, so we got to buy new ones yesterday. I absolutely love little boy pajamas. -My mom and sister and I booked a girls trip to a certain sunny city for Labor Day. I'm going to have my people call Jennifer and Courtney's people and see if we can do lunch. -We rented Night at the Museum. Lots of people had told me we would like it and they were right! I loved Owen Wilson's Little Cowboy character. Also? I have a major weakness for Kettle Corn, which is sold in individual packets right next to the cashier at Blockbuster. -This is old news, but Curt and I have greatly enjoyed welcoming the Beckhams to America. 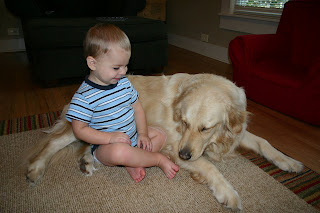 As you know, we have a lovely golden retriever named after David Beckham. I'm sad to say that our invitation to their party (hosted by the Cruises) got lost in the mail. Is anyone else but me obsessed with Katie's new hair? She was my sister in baby bangs, you know. It's time for this Wonder Woman Wannabe to don her Adidas and make an appearance at aerobics! See ya! Hello out there in blogland! (Do you remember that voice on Nick at Nite that would say "Hellooooo out there in TV land!"?) A lot of life has happened in the last week. Jackson and I drove down to Houston to spend some time with my family. Mom and Dad are leaving for Africa soon and we wanted to see them before they go. We had tons of fun, as always. It just went by way too fast. We celebrated my sister's 25th birthday with a Thanksgiving feast. The food was so good but my son was in rare form. He was chucking the precious dressing and the yams across the table. There I was, with a delicious green bean casserole to my left and a cheeky little toddler to my right, trying to find my happy place. Then my dad decided to try to coach me on how to deal with it and it just went downhill from there. (I love you, Daddy!) It is really weird that my sister is 25. We are getting up there! Dad and I went to visit my Pappaw in the hospital. He's really not doing well and it kills me. He is in a terrible amount of pain. Hopefully he will overcome this but I just don't know if it's going to happen. It was hard kissing his forehead when we left, thinking that it could possibly be the last time. I don't know what I will do one day when he's gone. He is very high up on the list of people who love me the most in this world. And vice versa. Last Saturday night we concluded our Saturday night service. Today was our first Sunday back in the morning services. We have been a handful of times but it was like coming home from college or something. It was probably two months ago when Curt first told me he thought we should cancel it. It has been a hard couple of months for us. "Hard" is all relative though. Sunni's younger sister Tiffani is having open heart surgery soon. Please keep her and her husband (of only two months) in your prayers. Sunni's in a tough spot because she needs to be in Houston with her sister right now but she cannot have Ava in the hospital. 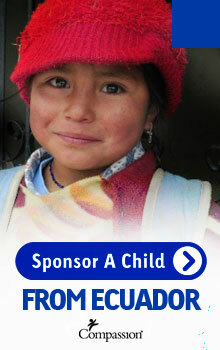 Please ask God to provide for every need. In about a week we will head to Missouri where Curt will speak at the youth camp for his home church. We will also get to spend some quality time with his family. We can't wait! It will be our first trip up there since Thanksgiving. Jackson has been doing a lot lately, like trying to say more words. He learned "cracker" yesterday and has been saying "ball" and "dog" somewhat clearly. It's very crazy to realize how much he understands of what we say. Seeing him learn is so exciting. My mom had him counting to four. Well, she counted to four and he said "two" over and over. He was mostly interested in playing with the rocks mom was using to teach him. Friday night I got to help Janelle coordinate a wedding at our church. The bride, Ashley, was one of our college students when we came to our church. She and her friends welcomed me with open arms and loved on me from day one. They are all very special to me. We got to witness Ashley and Brant fall in love, so it was neat to be there on her big day. I remember eating lunch with her at Chick-fil-a one day and analyzing whether he could be the one. Ashley, you were a beautiful bride and you are going to be an amazing wife! Saturday was family day. We took Jackson to Bedford Splash and had the best time. The two adults to one child ratio worked really well. Jackson is so adventurous in the water that it made it much easier to have two extra eyes, arms, and feet to tend to him. This evening I conquered the grocery store with my long list of ingredients for three meals. So I have one week to make taco salad, chicken spaghetti, and chicken cheddar rice bake. That is a lot for me in one week, folks. I am so out of the habit of cooking. It's shameful, really. Tonight we had taco salad and a very pathetic version of strawberry shortcake. It was so pathetic that soon I will have to find Simri's recipe and try to mimic this masterpiece. So with this last week at home before our trip, I am asking God for the June Cleaver anointing. Really, the Wonder Woman anointing. I need to do excellent work, be a good mommy, clean, cook, and be an attentive, loving, and selfless wife. Oh, and work out. I cannot imagine how I'm going to earn gold stars in all of these categories in the next 7 days. BUT, I have Christ in me, the hope of glory! Amen? And when I overcook the chicken, you better know I'll be praising Him for His grace. I may not be around much this week, but I plan on blogging more after camp. Have a great Monday! I've always thought the blog is for me, not me for the blog, but right now it's taking a larger place in my life than it should. So I'm going to take a little blog break. I'll be back in about a week. Blessings to you! My friend Cassi tagged me for a "5 Things I Dig About Jesus" meme. 1) He chose the weak things of the world. When He chose the disciples, he did not pick the kind of young men who were most respected, who were extremely intelligent, or who came from the best families. He used ordinary men and He did extraordinary things through them. That way, He got all the glory. When He looks for someone to use, He doesn't require pedigree, perfection, or natural talents. He can even use people who have messed up terribly in their lives. I appreciate that because if not, He couldn't ever use me. He looks for who will give Him all the praise and who is willing to be used in any way He asks. I love the way He is glorified through our weakness. 2) He is my hope of glory. Through Jesus living in us, we can live beyond what is natural for human beings. We are not held captive to our fleshly thoughts, we are not destined to give into every temptation, we are not limited to what we can do in our own strength. He enables us to live lives that please Him. "Christ in [us], the hope of glory" is the ONLY reason we can do that. 3) He has a name written on Him that no ones knows but Himself. It has never been profaned. I love His holiness. 5) He works in my life every single day in big ways and small ways. I love having a Savior who is so personal and so active in my daily life. I love that there is enough of Him to go around. Ask Him to give you eyes to see His work in you and around you. 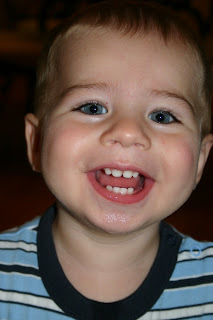 1) He has 10 teeth with three on the way. 2) When he takes a bath, the water must be running the entire time. 3) Preferably the freezing cold water, which he gleefully splashes on himself. 4) He hates getting out of the water. 5) He likes to watch himself kick and scream in the bathroom mirror. 5) The lowest point of the day is getting him dressed. 6) I usually put mousse in his hair (for the fauxhawk) and he tries to steal the bottle away from me and get some of the leftovers in his mouth. 7) It hurts his feelings when I clip his fingernails. 8) He likes to read and eat books. 9) He has some incredible dance moves. He has no inhibition. 10) We have Jackson's Dance Party in his room every night. Daddy plays the guitar or we listen to Hillsong United and David Crowder. 11) His second favorite game after hide and seek is steal the pillow from mommy. 12) He just discovered the fun of opening and shutting doors. But thankfully he can't turn a door knob yet. 13) A few nights ago he got on the floor and snuggled with Beckham. I hate myself for not getting a picture. 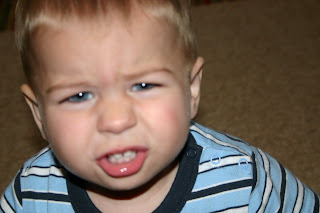 14) Lately when I try to get a kiss he slaps me or grabs my mouth. 16) He is officially only taking one nap a day and I actually like it. 17) He really likes to play with disposable cups. After he crumples them, he brings them to me to straighten out. 18) If he never had another toy besides a ball, he probably wouldn't mind. 19) People are constantly telling me what a happy boy he is. 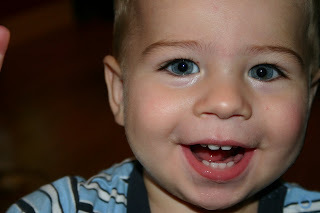 20) I can't believe I get to be his mommy. 1) I think it's cruddy when people leave critical, contentious, or hurtful comments on blogs, especially when they do so anonymously. If you're willing to say it, own it. And maybe provide a way for the blog owner to reply to you privately. 2) Today was my first experience taking my child to Chuck E. Cheese. 3) Then I went to Barnes and Noble and bought Bringing Up Boys and Dare to Discipline. 4) I'm enrolled in MOPS for the fall. 5) I thought motherhood was hard when I had an infant, but I'm just now starting to realize why people say being a mom is the hardest job in the world. It will take a lot more than sleep to bring up my toddler in the way he should go. I just read that Lady Bird Johnson passed away. Every spring I think of her when the glorious Bluebonnets, Indian Paintbrushes, and all the other wildflowers spring up on our highways. I got to visit the LBJ Library and the LBJ Ranch as a kid and I've always had an affection for her. Here's an article about her impressive life. I've been on a DVD binge for a few days. There was a time when Curtis and I frequented the movie theater so much that we had no reason to go to Blockbuster, but that day passed on February 17, 2006. Curtis went out of town for 36 hours last weekend and Jackson and I stayed home. I'm a huge baby when it comes to being alone overnight, so I have to give myself a pat on the back for being such a big girl about it. I did beg Janelle to call me if she was doing anything interesting in those 36 hours. Yes, I know I'm pathetic. Jacks and I got to have dinner with Janelle and her family and it was very fun. What's really cool is that Jackson is old enough to actually keep me company now, so I never felt lonely. On the way home from Janelle's we stopped at Blockbuster. I was giddy knowing I could get any chick flick I wanted without feeling bad for the hubby! I got two - one was okay, one was bad. When I returned them (on time!) I decided to pick up two more movies that were a little more substantial. Both were good, one was excellent. Have you seen Freedom Writers? Curt and I have a tendency to overblow the movies we like and then our friends are disappointed when they see them. Kay and Christine seem to be our most frequent victims. I don't want to say too much, but I loved this movie. It does have harsh language, so don't say I didn't warn you. If your movie-going days have been replaced by Blockbuster or Netflix or whatever, plan a date with this movie and a package of kettle corn and a box of Kleenex. By the way, did you know you can design your own Kleenex box? They even have a blog for it. Looks like I have another one to add to my bloglines! When I was a kid we used to celebrate my birthday at a steak house called Taste of Texas. These days it's a great big restaurant that is so popular you have to wait for two hours to get a table. But back then it was dimly lit, intimate restaurant in the shadow of Town and Country Mall. I cared nothing about steak, but there was a horse-drawn carriage at the restaurant that would take you on a nice little tour of the area after dinner. This was the number one reason we went to Taste of Texas every year. To put it mildly, I was obsessed with horses. Truly obsessed. I would spend a great deal of my birthday dinner outside the restaurant petting Bob the horse and talking to the carriage driver. As soon as dessert was eaten, my dad would join me outside and we'd pay the carriage driver to take us around. It was the highlight of my birthday. One year (I think I was turning 9) my dad was explaining my out of control love for horses to the driver and somehow by an act of God the woman offered to sell us a pony for $75. This pony's name was Coco and the woman and her family had used him for pony parties. I was ecstatic. It was the happiest day of my entire life. I could not believe my dad said yes! Very soon we went to meet Coco at this family's farm. I was immediately smitten with my equine friend. As they say, love is blind and this love was no exception. I did not allow the fact that the first time I sat on him, he went to the bathroom, or that he then squished my leg up against a pine tree, to cloud the glory of my horse ownership. It was not long before we moved Coco the Wonderhorse to our family farm in Waller, Texas. It was only a 40 minute drive from our house - an incredibly beautiful drive, in fact. My dad basically grew up on that farm and I think he enjoyed being there as much as I enjoyed my adventures on horseback. Daddy took care of all the saddling and bridling. He would trot Coco and me around on a lead rope when I got bored of walking. He rescued me countless times when Coco ran me into a barbed wire fence (definitely intended for cows, not horses) or rubbed my leg against a tree trunk. That little pony was ornery. He knew exactly what he was doing but I was so infatuated I would never admit that he didn't genuinely love me and care for me. Then there was that time when he took me under a low branch. I knew we were headed for trouble because the branch was definitely not high enough for me to duck under. He would not be steered away from it, so I closed my eyes and held my breath. Next thing I knew, I was laying on the ground. I'm sure my dad had some choice words for Coco the Wonderhorse, but all I can remember now is how he looked cutting the branch of that tree. I can still picture him - his black hair and his back to me, his arm going back and forth as he sawed it off. Dad would show me different parts of the farm where he did this or that as a kid. He would tell me about riding his own Shetland pony out there - Pony B. Pony B was so bad, his legs had to be in restraints when he was ridden. One time the whole family thought it would be great to remove the restraints for my dad's turn to ride. Pony B took off like greased lightning toward a bull. My poor dad was probably terrified, but everyone looked on and cheered, "Ride him, Keith! Ride that Pony B!" I love how hard my dad laughs when my aunts and grandparents tell that story. One ornery Shetland pony, one young dad, one young girl, one farm in Waller, one collection of amazing memories with the man who raised me. My horse fascination continued up through junior high, when I upgraded to a quarter horse thanks to my Pappaw. Once boys entered the picture in high school, that season of my life drew to a close. Now, I would still put horseback riding on my list of hobbies. I still take any opportunity to ride that I can get. I still like to sketch horses on my worship bulletin at church sometimes. I still love the smell of horse sweat and would choose it over perfume any day. But that hyperventilate-with-excitement feeling did fade over the years. Which is probably best anyway. What did not fade, what has in fact grown, is how much I love my daddy. The time we got to spend together driving out to the farm and riding that silly horse bonded this mama's girl and that young dad who wasn't sure his daughter needed him all that much. We had something special together that Mom and Melissa weren't a part of. Who knows what we talked about on those car rides, but I do remember chatting it up all the way. On the way home, we would stop at a little shack called JR's Chicken and get a huge Coke and a bucket of chicken. That place is no longer there, but we have often talked about how much we wish we could go back. Our family farm was sold years ago, but Dad and I have a standing date for a trail ride every time we go to the mountains. Daddy, thank you for getting me a pony. I know now that Coco didn't really love me. That he didn't really deserve the title of Wonderhorse. That $75 for a horse of that caliber wasn't that much of a bargain. But I knew then and I know now that you love me. And you definitely deserve the title of Wonderdad. I love you with my whole heart. Happy 51st birthday. I have to brag on the Lord because we had surprisingly good weather yesterday. So good, in fact, that I made Curt give a clap offering with me at the end of the night. I'm going to try not to say the "r" word because I know y'all are sick of it. So am I. We had invited a few friends over to cook out last night. We would have a baby pool for the toddlers and eat outside with the squirrels, birds, and mosquitoes. Homegirl started stressing out a bit when (A) I wasn't sure Curt would be able to mow the lawn-slash-marsh if it didn't dry up. AND (B) I wasn't sure how we would grill burgers and hot dogs if wet stuff was falling from the sky. It would kind of cramp our style. Not that we have a style or anything because the Jones home is rarely the site for social gatherings. I do not have the hospitality gene that so many minister's wives have. And our house is 1,100 square feet on a fat day. We decided the backyard was too soggy for our purposes and turned the front yard into the gathering spot. The grill, the baby pool, and the chairs were all set out there. By the time things got going, I realized I had made a huge mistake assigning Curtis to the food and myself to taking care of everything else and Jackson. Trying to supervise a very active toddler swimming in the front yard (when he'd rather be running down the street) and hostessing a gathering simultaneously? Stoooopid. Call me idiot girl. I deserve it. All I'm saying is, next time I'm getting a nanny. And if I don't, someone better bring a tranquilizer gun and shoot me with it when my child chokes on some cheese and blows chunks...again...in a high traffic area. And after I finish hosing it down, please prepare a cool compress for my head before he blows chunks...AGAIN...in the baby pool after gulping too much water. An hour later, when I saw that my child had something crusty going on around his mouth and chest, it occurred to me that I forgot to clean him off after vomiting episode two. I asked Janelle and Sunni what it was like to have recently witnessed me in my most humiliating parenting moments. At least they love me. The girls settled inside with the little ones and performed our eat-and-feed-at-the-same-time-tricks. A little while later we looked outside and saw all our husbands lounging peacefully and having complete conversations, eating seconds and thirds. We agreed that it would not be long before we marched outside with our dessert and politely insisted they trade places with us. It was a beautiful thing. We had 20 minutes of peace and deep conversation before it was time to load everyone up and head to a fireworks display. We positioned ourselves on the perfect hill in Las Colinas and waited about 40 minutes for the fireworks to start going off. It seemed like they were really taking their sweet time. Then we figured out we were positioned completely wrong and the fireworks were already going off in the middle of a bunch of office buildings. It was way too late to move. We could only see enough to tease us - we knew what the people gathered at Williams Square were seeing was amazing! Oh well, it probably would have scared the babies. The night was crazy in every way, but so much fun. I have some great memories to laugh about every 4th of July until I'm wearing my red hat and can't remember anymore. And really, when things go perfectly there's just nothing to write home about...or blog about. I confess, I've been eyeing some MLS web sites lately. I really don't think God has it in our near future to move, but I can't help but think about it. A developer is trying to buy our whole neighborhood and there was a note on our door recently that indicated we could close in as little as 7 days. Isn't that nuts? They aren't shelling out the big bucks or else we would be very tempted. I've had to really pray about this because I do not want to have the grass is greener on the other side syndrome. We live in a suburb that was fresh and pretty about fifty years ago. By now it's got some rust. Honestly? A lot of rust. Still, our neighborhood has old-fashioned charm. Under normal circumstances, like when I've seen the sun shine on it for more than two hours at a time, I can forgive the urban deterioration and focus on the old school appeal of my community. And there's always the church - the church that I love with my whole heart - situated within a stone's throw of my driveway. I love that. Well, God gave us the best Fourth of July. It renewed my love for my community. We basically rolled out of bed yesterday and walked down to our city's parade. Here are some pics for you. 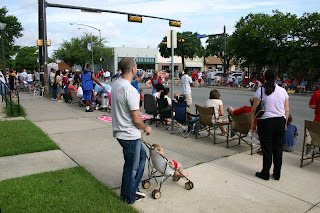 Let me tell you how excited my hubby was to be at the parade. I think he ended up having fun though. He gets a HUGE A+ for being Super Hubs yesterday. 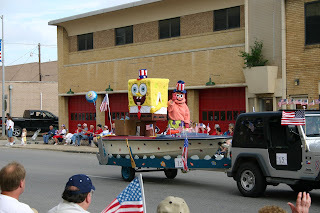 Michelle, this is in honor of you having been Spongebob at camp one year. 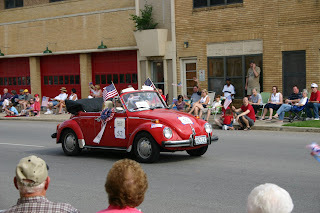 Erin W., this is in honor of the VW bug convertibles we wanted - painted with hippie flowers. This is in honor of the husband and wife who tool around town in their matching motorized chairs. They make it happen in those chairs. This might be the hubby, but if so I'm freaking out that his wife isn't with him! Meet the beauty pageant winner who holds the title of Mrs. Mature. I do not know her but she is very pretty and I liked her red pom pom. 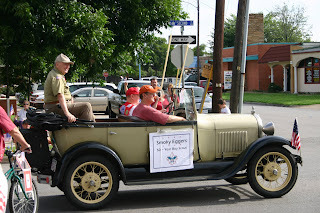 This gentleman has been a Boy Scout for 50 years. If the Red Hat ladies are still around when I'm sassy and silver, you better believe I'm joining them. 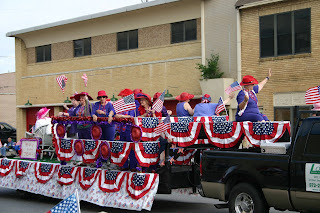 In case you were wondering, their float says "The Frisky Foxy Jewels." 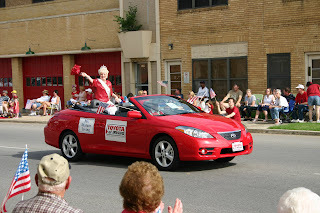 I only had one disappointment with the parade, other than that I was not riding on the back of a shiny red convertible wearing a tiara and waving a red pom pom. 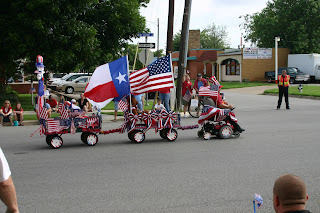 When the Sonic float came parading down, I was just convinced that they would be throwing tots out to the crowd. I was ready and willing to catch some tots! It was not to be. They were handing out coupons but I was not graced with one. I have more to say about the 4th, but I'm sleepy and need some tea. I'll be back! Kittyhox came really close with Pretty Hot and Tempting Christ-Only Women, so I will be sending her a copy of Get Out of That Pit by none other than my mother. Unless she already has that, in which case I'll figure something else out. We had so much fun with Curt's mom and grandparents over the weekend. We're very thankful for their willingness to make the long drive to come see us. We will make the trip to Missouri in about a month. We did indeed visit Sprinkles and JD's within a three hour span. We still have half a coconut cupcake and six chocolate chip cookies in the kitchen. Hopefully they will get stale before we can eat them all! We spent some quality time at Northpark Mall where I hit the jackpot at the Lucky store. They were having an insane sale! Basically, it was 75% off most of the store. I bought two skirts for me, matching long-sleeve t-shirts for Curt and Jackson that will be so cute in the fall, and a British flag track jacket for Jackson. It is all out of control cute. So have y'all gone to see Evan Almighty yet? We took advantage of having a free babysitter on Saturday night and went to see it. Curtis and I laughed so hard. The robe just sent me over the edge. But seriously, someone needs to build an ark in the homeland because it has not stopped raining in days! Our church's preschool water day was rained out last week and my friends and I were very disappointed. 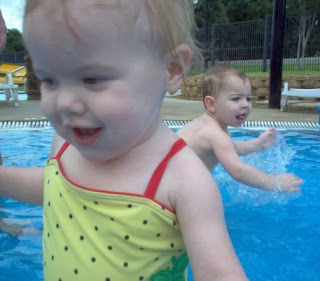 So we planned a Monday playdate at Bedford Splash. After all this rain, we were really heartbroken to hear predictions that this week would be just as wet. We surmised that if it was raining at 11 a.m. we would not go. But lo, there was blue sky over our little piece of the Metroplex at 11:00. Glory! Two hours, all I wanted was two hours of swimming! Jackson and I hadn't gotten in a real pool together all summer and, hello, it's already July! Oh my gosh, how is it July? The Lord gave us exactly two hours at the kiddie water park and it was too much fun. Jackson was very happy to be there and proudly displayed his perma-grin. Thank God, he did not blow chunks. He did not stop moving the entire time we were there. He even got bored with the water and wanted to run between the lounge chairs. I don't think I finished more than two conversations with my girlfriends, whose toddlers obediently played within ten feet of where their mothers placed them. I've learned through Gymboree and other experiences like today that my son likes to do his own thing. 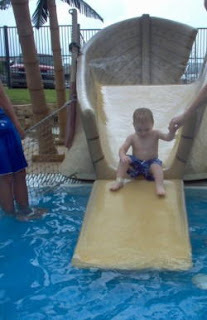 He also likes for Mommy to bounce him around in the lazy river. Tonight I was as happy as can be sitting on the couch, my chlorine-smelling arms wrapped around my baby boy, whose sweet little hair smelled like Coppertone. Gotta love summer.